Playing games on your smartphone can quite relaxing and fun if you find the right game that offers you all that. However, because the amount of games available choosing the one that will test your skills while letting you to have fun is not that easy. Luckily for you, we decided to help with your search. We looked and we have for you one amazing casual game with addictive and relaxing ball bouncing gameplay – Extra Ballz. Let’s see what the game offers you. This casual ball bouncing game is easy to play and fun for all ages, developed on android platform, very addictive and entertaining, helping players relax their brain each time they play. 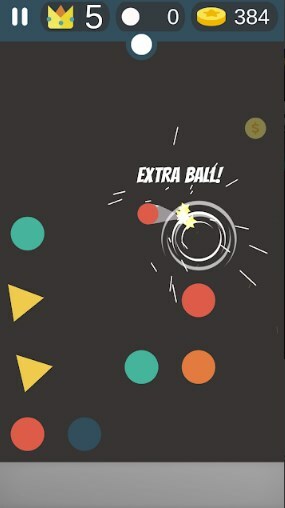 With the simple controls and endless gameplay offered, the players will have fun and challenge themselves to be fast and precise, swiping the screen to let the ball break the shapes coming up. Sharpening the player’s skills and easing his brain, players will get addicted to playing quickly. Why do we choose Extra Ballz? Extra Ballz has to offer for its players various great features that will get them addicted fast and keep their attention each time they are playing. With this game, the players will have fun and enjoy relaxing their brain with fulfilling one simple task. The player needs to swipe the screen to use the ball and let the ball break all shapes coming up. Each player needs to clear all the shapes before they reach the top and kill the player. By making combos that is also offered on the game, the player will get extra balls for breaking the shapes. For endless fun of each player, the game offers them to match the ball color with the shape to win coins that will bring them a lot of extra perks. Not only that the player can test his skills but also he can challenge his friends to play the game and compete to see who will become the ultimate ball bouncing player of this game. Download this game on Google Play for free and have fun breaking shapes by swiping the ball!